The Californian coast is somewhere I'd wanted to go for a long time. The "Lifestyle" tab on Squats & A Side Of... is intended for exactly this. Allocating a space on the internet that through my eyes is enriching, refreshing, insightful or just too good not to mention. Travel and dining definitely fall into that category and if you're into fitness and fashion, I'll bet you're also into trendy bars that serve amazing pancakes. My Instagram has documented my experience in photos but a beautiful eatery called Malibu Farm Cafe is somewhere I adored and wanted to share also in words. On June 28th we ventured there for brunch. The cafe is situated right on the tip of Malibu Pier which makes it an incredible viewpoint and setting for dining and parties. For hours I could drink coffee, watch the surfers and soak up the sunshine. Being English, we obviously chose to sit outside on the rooftop but should it get a bit chilly there's also plenty of light and airy indoor seating. It has a rustic farm-to-plate feel about it and this was more than evident in the food. Fresh, Local & Organic is their message and from service to salt shaker the consistency was apparent. Having a flat stomach for sunbathing that afternoon couldn't be further from my mind, I fully intended on eating an American sized portion no problem, but knowing you're indulgences aren't packed full of un-natural and processed ingredients makes them taste even better. "I use mostly whole wheat flours and whole grains. Lots of veggies, and fruits, I love arugula and I totally believe there is no such a thing as too much lemon. We use no fake food. Margarine, veggie butter, sugar substitutes? What is that stuff? If you don't know how to make it, or where it comes from, don't eat it. don't buy it. I don't use low fat or non fat products, cause nothing makes you fatter than eating fat free. This is a fact. Eat the real thing, or don't eat it at all." Multigrain pancakes with bacon bits and maple syrup was my spoilt-for-choice, choice. Complete with unlimited coffee and lemon iced water. A grand total to $14 incredibly well spent. 3 pancakes on top of one another with a glass jug to serve my own syrup was brought out within 10 minutes of ordering. Hot, fresh and melty in my mouth, they were INCREDIBLE. My boyfriend opted for the Farm Scrambled eggs with seasonal sauteed veg and wheat toast. Wowzers was that a generous portion. By that point I was too busy enjoying such a perfect morning, taking more photos slipped my mind. 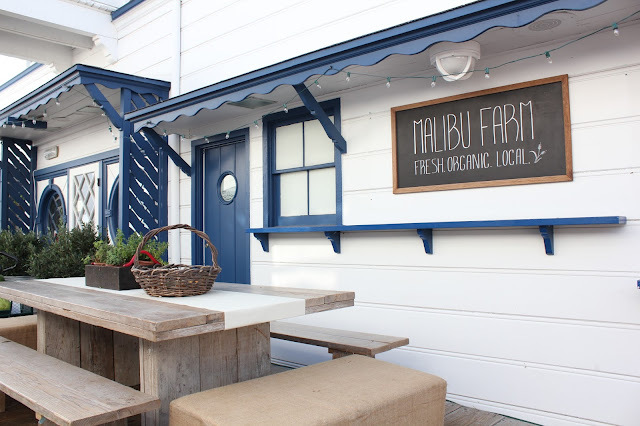 But to capture a bit more of the Malibu Farm essence, head to their website here. If you're ever in the area, it's a must do!